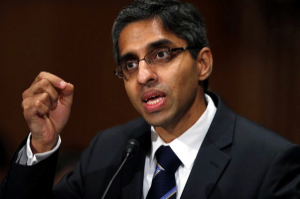 Dr. Vivek Murthy, Faculty at Harvard Medical School, and president and co-founder of Doctors for America, was nominated by U.S. President Barack Obama to serve as the 19th Surgeon General of the United States, and confirmed by US Senate in 2014. He has worked to better the lives of Indians through his work in HIV prevention and AIDS education as president and chairman of a non-profit organization called Visions Worldwide, as well as for all Americans through his public health advocacy. Dr. Murthy was the Commencement Speaker at the Harvard Medical School and Yale School of Medicine in 2014. He is currently a practicing internal medicine doctor at Brigham and Women’s Hospital in Boston.